I was fortunate enough to get permission to hunt a 160 acre piece of property in Northern Midland County for the 2017 turkey season. The owner of the farm did not want me to use a pop up blind, decoys, or a turkey call. “You don’t need all those gimmicks,” he said. The sharp-eyed 70 year-olds farm held a huge number of turkeys and I felt lucky to be able to hunt there so I was not about to question him too much. The first evening I ignored his advice on where to sit and I found myself along a brushy wooded edge overlooking a grassy field where 10 toms and one hen all walked past me but were well out of range, so I let them go. I came back the next afternoon and talked briefly with the wily farmer and he suggested I sit in his old, abandoned corn crib that overlooked a huge field. I looked at the corn crib and then looked at the farmer to see if he was kidding. A sly grin came over his face and he said, “There is no magic in this; you need to hunt where the turkeys are going to be, not where you want them to be.” So I walked over, grabbed my Mossberg and a folding chair and walked out to the creaky, wooden-slatted corn crib for my evening hunt. The landowner said the turkeys had been crossing the open field diagonally and should walk right by me. I had my doubts, but shortly after settling in my chair, I was looking through my binoculars off to my right and saw eight turkeys about 250 yards away. Three hens put great effort into dusting themselves as two gobblers strutted around and displayed for the hens while three good-sized jakes paced around nervously, looking confused. I watched with great amusement for two, long hours and wondered if I would ever get a shot at any of the toms. Eventually, the hens started towards me and the toms followed behind, running, at times, to keep up with the hens. They worked their way diagonally across the field, just like the farmer had predicted. When the turkeys were about 50 yards away, I realized I would have to be patient and wait for the toms to separate so I could get a clean shot. At 25 yards, with shaking hands, I squeezed the trigger on my Mossberg and saw the tom go right over backwards at the shot. With my heart pounding and my hands shaking, I had just harvested one of my best toms ever. 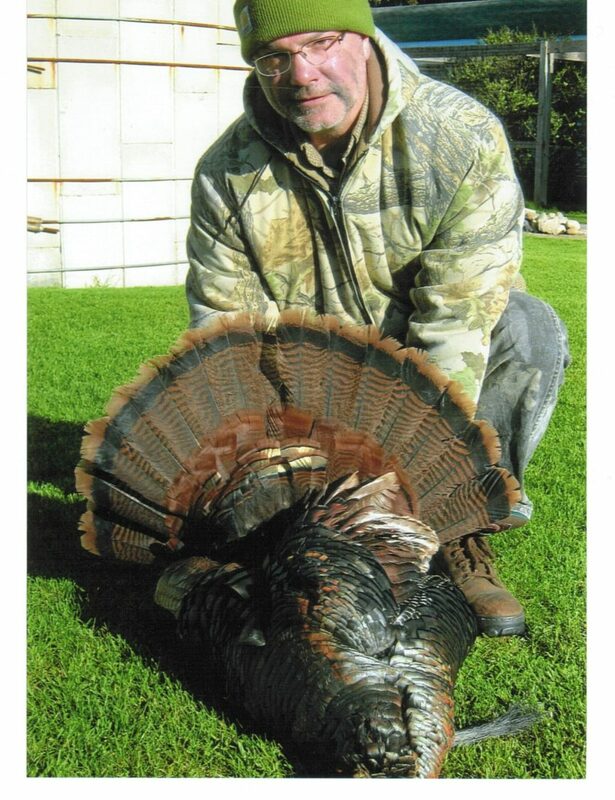 He had a 10” beard, 1 ¼” spurs, and weighed 19 lbs. Just a beautiful bird. Luckily, I was able to find some Mid-Michigan Magic in that old, abandoned corn crib.